Hello again! Every now and then, my husband does something so amazing, so wonderful, so delicious that he needs to be recognized. This is his post. I hope you enjoy, and are brave enough to try it! 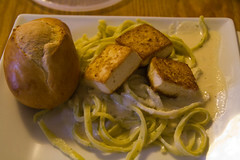 I woke up this morning with the itch to do something new and having just seen crd!‘s Spinach Fettuccine Alfredo with Scallops I’d been thinking about making pasta. 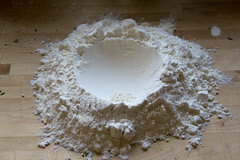 I used the stand mixer to mix the eggs and the salt and then used the well method (watch the YouTube video) to combine the wet mix and the flour. 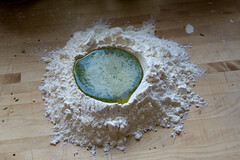 Once all of the ingredients are mixed thoroughly, let the dough sit. If you can let it sit for an hour, do it, otherwise 20 minutes will do (he longer it sits the easier it is to roll out). 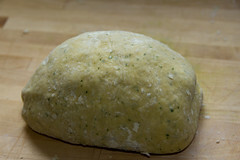 After you’ve let it rest cut into quarters and the roll out each quarter, aim for about 1/8 an inch, this will vary based on the wet to dry ratio of your dough. 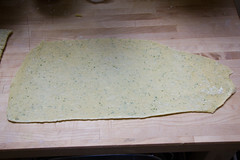 Once you’ve achieved your desired thickness, ensure that the top of your dough is fairly dry and then roll up the dough into a cylinder and then slice the rolls, producing a long fairly thin strand of pasta. 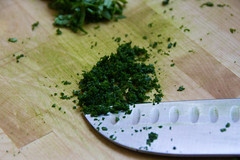 I found that short, fast strokes with a very sharp knife yielded the cleanest cut. 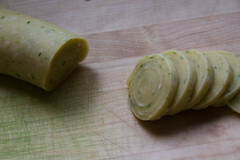 Unroll the little pasta wheels and lay the pasta flat. I separated each layer with a paper towel, I’ve also seen it hung from dowels. The pasta is immediately ready for cooking but I let the pasta sit in the fridge for about 4 hours and it was just fine. 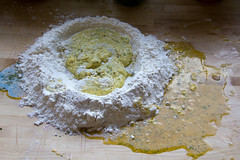 It cooks much faster than dried pasta, in just a couple of minutes. Wow, this is a great post. 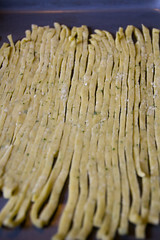 I have never made my own pasta, but I’ve always wanted to try it, seems like it would be so much nicer and softer and tastier than the boxed dried stuff. Thanks for the inspiration! Next Next post: I’ve Changed My Name!